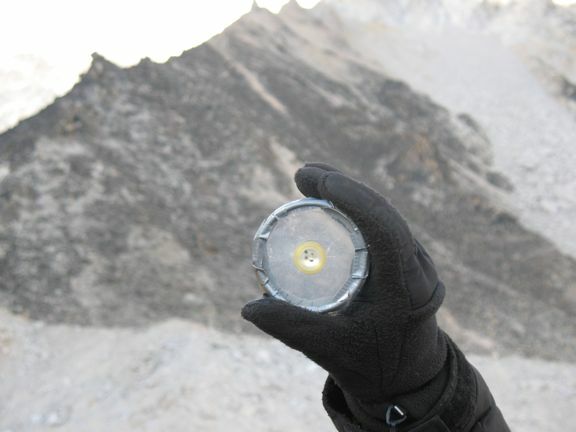 Astronaut Scott Parazynski - in the midst of a historic summit bid at Mount Everest - is carrying some small pieces of moon rock as he climbs to the top of the highest spot on Earth. This sample was loaned to Parazynski's team by NASA which seldom gives out pieces of the lunar regolith gathered by the twelve Apollo astronauts who flew to the moon between 1969 and 1972. The lunar sample carried by Parazynski was collected by Apollo 11 Astronaut Neil Armstrong in July 1969. Numbered as sample 10085,134 this was one of the surface and subsurface samples picked up about 15-20 feet (4-6 meters) north of the Lunar Module "Eagle" which landed in the Sea of Tranquility. 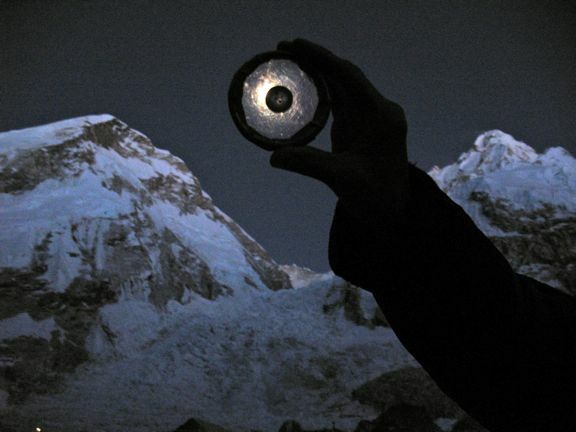 If all goes according to plan (and it often does not on Everest), the rock fragments will reach the top of the world little more than two months before the fortieth anniversary of the Apollo 11 lunar landing. 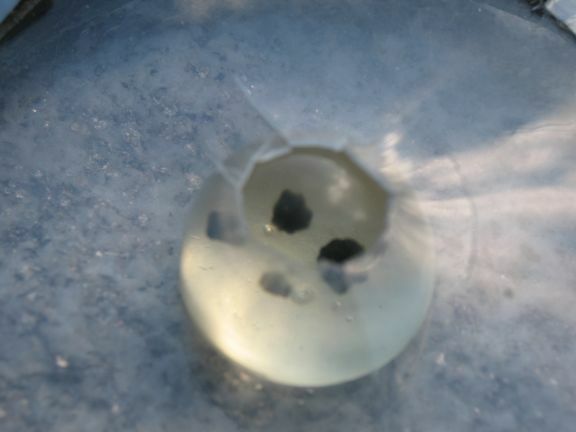 This sample weighs 0.052 grams and is encapsulated in a clear acrylic "button" approximately 0.75 inches (1.9 cm) in diameter. The parent sample from which this smaller portion was taken weighed 569 grams (1.2 lbs). A temporary outer enclosure was created at Everest Base Camp to further protect the sample, to allow it to be handled by people wearing thick mountaineering gloves, and to allow it to be more visible in photographs taken at the summit. These tiny rocks are left over from pieces embedded into so called "Small World" plaques that the US bestowed as gifts to other nations and to all fifty states in the seventies. After his historic trip to the moon, Armstrong became close friends with the first man to summit Everest (in 1953) Sir Edmund Hillary. The two historic figures later traveled the world together - including a trip to the North Pole. 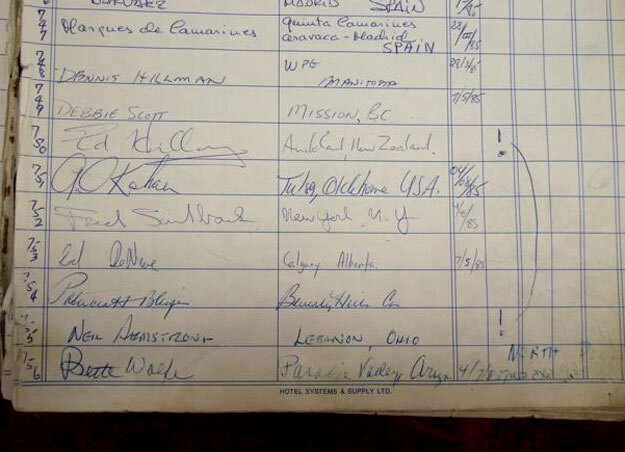 Image: this is a page from a logbook at an Inn in arctic Canada where Neil Amstrong and Edmund Hillary stayed during their trip to the North Pole in July 1985. Note the arrows and exclamation points added by someone later. Credit: Stephen Braham. Parazynski was able to secure the moon rock loan via a Space Act Agreement in place between NASA and the Challenger Center for Space Science Education. Parazynski's team includes Keith Cowing (located at Everest Base Camp), and Miles O'Brien (located in New York City). All three are members of the Board of Directors of the Challenger Center - established by family members of the crew of STS-51L shortly after the the shuttle accident in 1986. 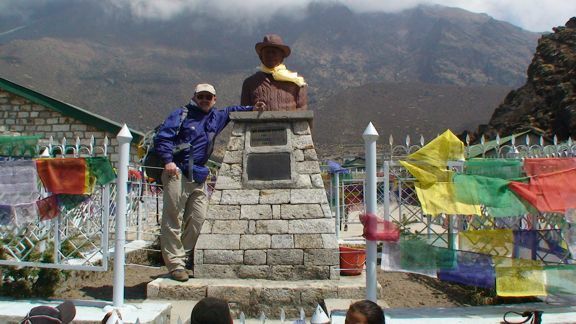 Keith at the Hillary School in Khumjung with a statue of Sir Edmund Hillary. In his hand is a piece of the Moon collected during Apollo 11. There are currently more than fifty Challenger Centers all over the world - providing an immersive, stimulating learning environment for middle school students who role play simulated space missions. During his Everest expedition, Parazynski answered dozens of questions posed by students at Challenger Centers all across the US via a satellite video link. Parazynski is sponsored by the SPOT Satellite Messenger Company - a unit of Globalstar. The SPOT device enables Internet users to track his steps in real time at http://www.SPOTAdventures.com. This is Parazynski's second consecutive season on Everest. Last year, he was in striking distance of he summit when a back injury forced him to turn back and hobble down the mountain. Thanks to some surgery and a rigorous exercise regimen, he is in great physical shape to achieve his lifelong goal this year. Parazynski is climbing Mt. Everest with International Mountain Guides again this year. Parazynski flew five times on the space shuttle (including one mission as a crew mate of Senator John Glenn) and performed seven spacewalks (including a daring improvised trip into the void in 2007 to unsnarl a snagged solar array at the International Space Station). He retired from the astronaut corps in March and is now employed by Wyle Labs in Houston. The moon rocks will be returned to NASA once Parazynski comes home. Image: Scott holding up moon rock sample 10085,134 inside its protective housing so as to eclipse the rising moon. The west shoulder of Mt. Everest is on the left.